One of the coolest things about the Pebble watch, and now Apple and Android watches how they give you notifications on your wrist. It’s not that you HAVE to be notified instantly of every single thing with interruptions, rather the exact opposite. Having notifications on your wrist allows you to quickly see what you DON’T have to deal with. Let’s say I’m out for a walk with the dog and I get a notification. I can flick my wrist and quickly see that it’s nothing important, so I don’t need to respond quickly. However, if it’s someone sending an important notification, maybe I do want to stop and pull out my phone and dictate a response to hold them over till I get home. $300 for an Apple Watch is an awful lot of money for this functionality. I get a lot more out of it than just notifications, but if you can’t justify that kind of money, maybe a simple $40 device that only does notifications would give you what you need. This is where Ditto from SimpleMatters for iOS and Android comes into play. Ditto is a tiny little device that attaches to your clothes with its built-in clip. It’s a bit smaller than a fitbit; about an inch and a half long, and almost an inch wide, made of smooth plastic with a built-in clip. There are no buttons, no lights, no switches; everything is controlled through the free Ditto app. Worn against your body, you’ll feel gentle vibrations when receiving notifications. Ditto is waterproof so you can even swim with it. It comes with a wristband which might be easier when swimming than trying to find a place to clip it on. 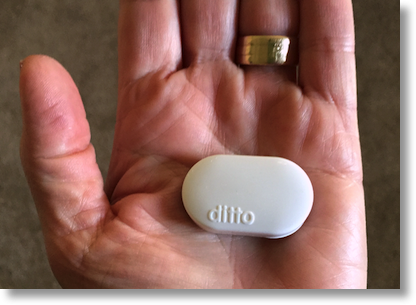 At CES, the folks from Simple Matters gave be two Dittos. Steve wasn’t interested in testing it because he already has an Apple Watch, so I gave the second one to Dorothy, aka Maclurker in the chatroom. She doesn’t have an Apple Watch so I figured she was a great person to test it. Plus she’s more critical than I am. Ditto has one of those small watch batteries, so you never have to charge it. They say that after many months Ditto will notify you through the app that your battery is low so you know when to replace it. After four months, Dorothy’s Ditto is showing 5% battery left, while mine says 35%. Without a display it sure lasts a long time. A common problem for women is that they don’t hear their phone ring or feel it vibrate because it’s in their purse. Dorothy reported that wearing the Ditto clipped to her shirt completely eliminated this problem. She didn’t miss calls or text messages, and the Ditto was so small and light she would forget that she even had it on. In fact, like everyone who’s ever worn a Fitbit, she forgot it on her shirt and tossed it in the laundry al least once. Luckily, she noticed it before the wash cycle but I’m betting that since it’s waterproof it would have been fine. The Ditto app lets you set up custom notification rhythms for each different type of alert. For example you can set one vibration for emails, two for texts, three for calendar. Dorothy especially liked that you could change that, so she set them in reverse. She liked that she could make it what her brain thought was right. You can even set up something like two vibrations close together, one alone, and two together again. I found that remembering all of these different combinations was too much for my little brain. I just knew that if it was vibrating, something interesting was happening on my phone and I might want to go check! In addition to the things I just listed, you can be notified if you get out of Bluetooth range of your phone, which they suggest could be handy if you’re the type who tends to leave your phone places. You can set Alarms and Timers through the app and then have the Ditto notify you when they go off. There’s a whole slew of other apps that Ditto supports: WhatsApp, Facebook Messenger, WeChat, Google Hangouts, Snapchat, Instagram and even Uber. After hearing this laundry list of things for which Ditto can notify you, you might think it would be buzzing all day long, you can turn ALL of these off and only enable the few that you really care about. I really like that you can assign Favorites, so you only receive notifications for phone calls and SMS messages from those people on the list. You can easily add people to the list within the app if you give it access to your contacts. I should mention that the app has a really elegant and simple design, and it’s really obvious how to change the different functions. Another key aspect of a device like this is that you don’t want it giving you alerts after hours. By default, Ditto is set to follow the same Do Not Disturb setting you have on your phone, but you can also set a timer on the fly; for example “don’t disturb me for the next 23 minutes”. I asked Dorothy for the bottom line, but I have to warn you that she is kind of a luddite. She doesn’t normally use Bluetooth for anything else – no Bluetooth headphones, no Bluetooth in her car so normally she keeps Bluetooth turned off. As a result, without the Ditto, her iPhone battery normally lasts two and a half days . She wore the Ditto for several weeks and while she really liked it, she found that her phone “only” lasted one entire day. She doesn’t get a lot of texts and phone calls so the utility wasn’t quite worth the reduced battery life for her. To be fair, I only recently talked her into turning cellular data on for her iPhone. She used to keep it off until she needed it. Her battery must have lasted a week till I fixed that! I think the Ditto is a lovely little device, and if I didn’t have an Apple Watch I would definitely use it. For $40 it provides a super simple way to know when only the most important notifications need your attention. You can get it in black, white, or a geeky clear so you can see the electronics inside. Check it out at SimpleMatters.com.